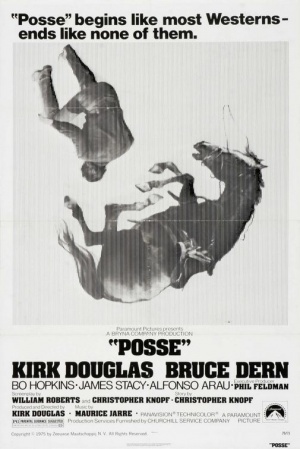 Posse is a 1975 Western directed by and starring Kirk Douglas as a politically ambitious US Marshal who leads an elite posse in tracking down a notorious outlaw (Bruce Dern). The Single Action Army is used by several characters in the film including US Marshal Howard Nightingale (Kirk Douglas) and outlaw Jack Strawhorn (Bruce Dern). The Winchester Model 1892 is used by members of both Nightingale's posse as well as Strawhorn's outlaws. Wesley (Bo Hopkins) fires his Winchester . Wesley (Bo Hopkins) talks to the other Marshals, some of whom carry the Winchester. A Springfield 1873 "Trapdoor" Carbine is used by one of Strawhorn's outlaws. A rack of 12 Gauge Double Barreled Shotguns is seen in Nightingale's office.